This year San Sebastián, Spain, has been honoured European Capital of Culture 2016 and the resident´s plans are to celebrate this amazing title in style. How? 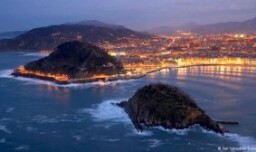 Well, the residents and visitors of San Sebastián will be invited to become part of the cultural program. Pedro Subijama, chef of one of Spain’s best-known restaurants and pioneer of the “new basque cuisine”, said “There have always been many cultural initiatives in our city”. This city is renowned for be a gastronomic city, that´s why “Food arts and Food culture” will be part of this cultural program.